The sixth book in the Captive Hearts series is now available on Amazon! This book is a prequel and covers Whip’s early years. Named at birth by his mother in memory of her father, he’s given a name that his father can’t bring himself to say. When Whip’s uncle suggests an alternative, the only evidence of the ‘sissified’ name is in the bible Elizabeth Harding records her son’s birth in. Dead of consumption before her son’s third birthday, the bible is buried with her, and so is the only evidence of Whip’s ‘real’ name. Raised by his father on their successful Texas horse ranch, Whip learns everything he needs to know to train and raise the finest working horses in Texas. But when one tragedy after another befalls the small Harding ranch, Whip’s father loses his drive and ambition and slowly the ranch begins to fall apart. 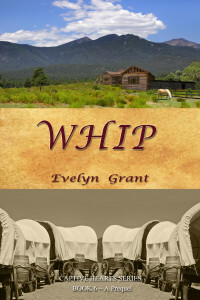 Whip is left alone at the young age of fifteen after a riding accident takes his father’s life. There aren’t many ranch hands willing to have a teenaged owner be their boss. Whip needs to make a decision. Should he attempt to try to bring the ranch back to its once profitable state on his own, or is it time to move on? Coming soon to Barnes and Noble, Kobo, and other ebook sellers. This entry was posted in Book Info and tagged Captive Hearts series, Whip by Evelyn. Bookmark the permalink.